The prevalence of obesity in Saudi Arabia was 28.7% in 2013 and similar to the west,. 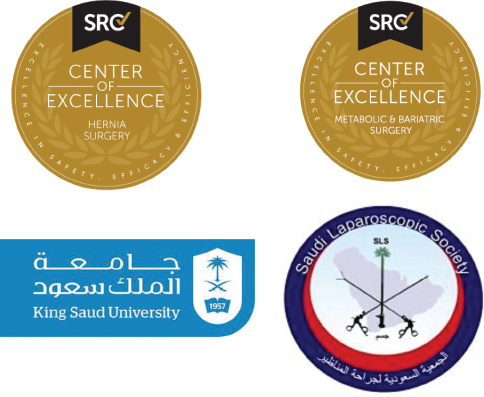 laparoscopi:c sleeve gastrectomy is nowadays one of the most commonly performed bariatric procedures in Saudi Arabia. Portal vein thrombosis was at first thought to be a rare and potentially fatal occurrence postoperatively. 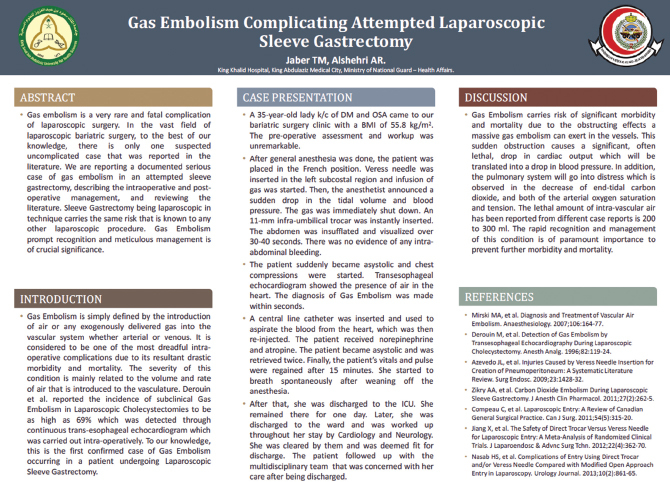 Recent data suggests that it is much more prevalent following laparosoopicsleeve gastroectomy of all o her bariatric procedures and prog1nosiis is fav orable given early diagnosis and treatment. To the best of our knowledge, this is the first report off cases from Saudi Arabia. 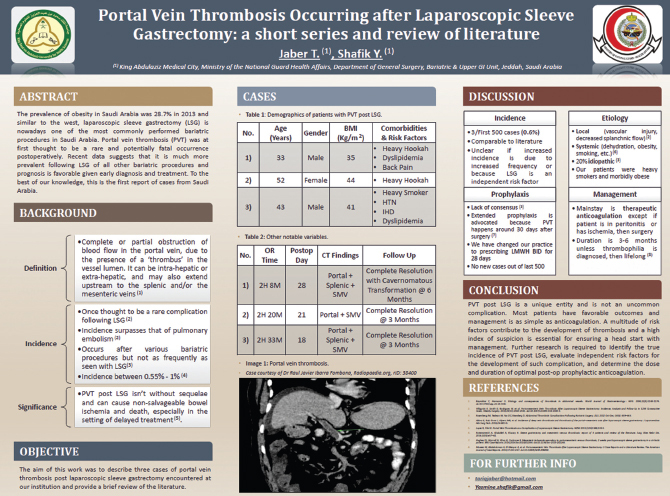 The aim of this paper was to describe three cases of portal vein thrombosis post laparoscoopic sleeve gastrectomy encountered at our institution and provide a brief review of the lli tera me..
Background: Non-alcoholic fat ty liver disease (NAFLD) is characterized by fatty infiltration and marked activation of inflammatory cells and cytokines. In obese patients, bariatric surgery has been shown to reduce effectively liver steatosis and inflammation with controversy when it comes to liver fi brosis. In this study we examined the effect of bariatric surgery on systemic inflammation in patients with NAFLD. The samples were collected prospectively as part of prospective study (number: NCT01619215). Objective: The present study aims to assess the correlation between liver function, systemic inflammatory markers, and liver histological changes in NAFLD patients undergoing bariatric surgery. Methods: Blood samples were obtained at two time points: just prior to surgery and 3 months post-operatively. Samples obtained to evaluate liver function, selected metabolic, and inflammatory markers. Results: Total of 51patients (16 male, 35 female) with a mean age of 33.6 (50=9.5), The median body mass index changed from 43.9±8.7 kg/m2 to 37.4±11.6 kg/m2 (p-value <0.0001). ALT dropped from 36 ±23.3 to 34±13.6 (p -value=0.03), Ill decreased from 3.2±331 to 3.2±431 (p -value<0.0001), MCPl decreased also from 611.9±393 to 550.4±443 (p -v alue=0.01), microvascular steatosis percentage dropped from 3±12 to 1±10 (p -value=0.0003) and macrovesicular steatosis percentage changed from 15±24 to 2±18 (p -value<0.0001). Conclusion: Our result revealed that liver function and systemic cytokines are improved along with histopathological changes in NAFLD patients 3 months following bariatric surgery. Further work is needed to study the long-term effects on these markers. Background: Obesity is a major risk factor for typeII diabete.sRecently, bariatric surgery has been shown to significantly reduce the diabetes-related morbidity and mortality with longstanding improvement in diabetes control. malabsorptive procedures like Roux-en-Y gastric bypass (RGYBP) and biliopancteatic diversion (BPD) are believed to be superior to restrictive procedures like sleevegastrectomy (SG). Objective: To determine the achievement rate of diabetes remission and glycemic improvement post laparoscopic sleeve gastrectomy (LSG) among patients with type 2 diabetes. 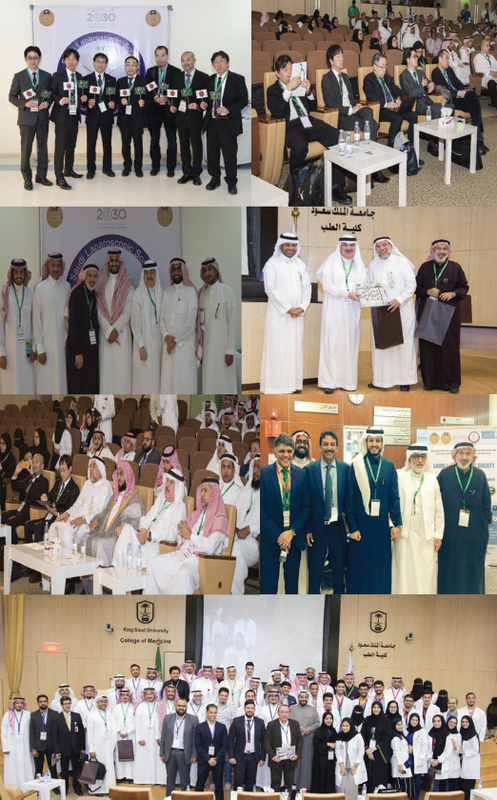 Materials and Methods: This was a retrospective cohort study conducted on 80 patients with type 2 diabetes who underwent LSG at King Khalid University Hospital (KKUH), Riyadh, Saudi Arabia from 2009-2016. Diabetes remission was considered if FBS (<7mmoVL ), H bA 1c ( <6. 5%) w i th cessat ion o f a ll d iabet ic m ed ica tion s. G l yce m ia was considered to improve if HbA1c decreasedby e:1% a nd F BS by 1 mm o l/1. 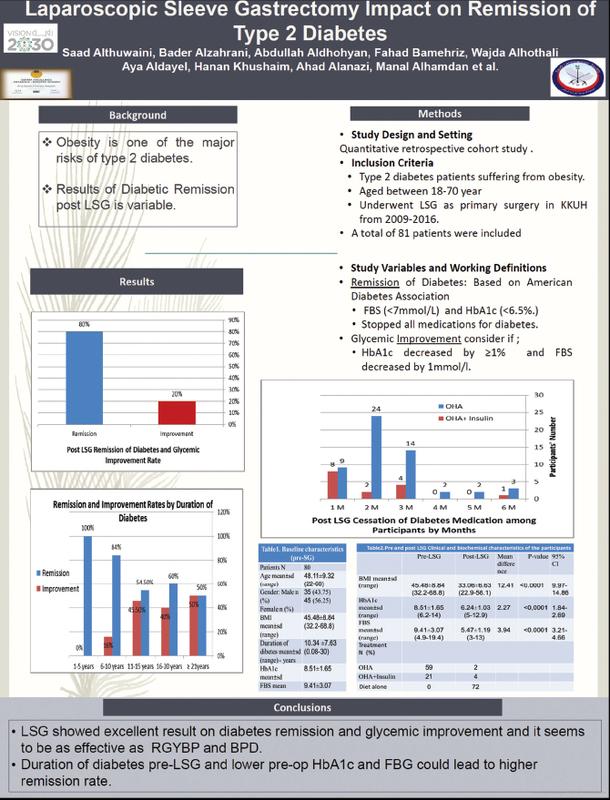 Results: We had64 (80%) patientswith completeremission of diabetes, and 16 (20%) with glycemic improvement post-LSG. The mean time of diabetes remission was 2.91 month s post-LSG. The BMI mean ± SDdropped from 45.48 ± 8.84kg/m' to 33.06 ± 6.63 kg/Ill'post-LSG (P<0.0001). Only two (2.5%) patients who were on oral hypoglycemic agents (OHA) alone pre-LSG required any treatment post-op. Those on a combination of OHA and insulin decreased from 21 (26.25%) to 4 (5%) post-LSG. Of 80 patients, 72 (90%) patients are on a healthy diet and discontinued diabetes treatment post-LSG due to remission of diabetesor significant glycemic improvement. According to our results, duration of diabetes pre-LSG and lower pre-op HbA1c and FBG associated with higher remission rate with a significant p-value (0.0019, 0.0004, <0.0001). Pre-op BMI does not predict remission of diabetespost-op. Conclusion: LSG showed good result on diabetes remission and glycemic improvement, and it may be as effective as RGYBP and BPD. Introduction: Obesity is a well-known cause of morbidity and mortality among children and adults. In the past decades, the number of obese and overweight people have increased worldwide especially in developing countries such as the kingdom of Saudi Arabia (KSA). Complications of obesity are not limited to physical health, but also extend to the psychological health. Prevention at the national level might be the best solution, however, it can't be achieved without raising the awareness. This study aims to evaluate the public perceptions of complications of obesity and different modalities of treatments including bariatric surgery. Methods: A questionnaire was distributed between August and October 2017 to Saudi adults in all five major regions of Riyadh City. 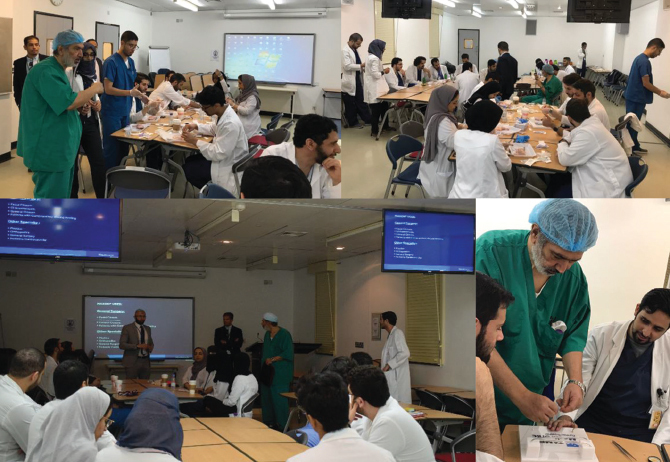 Volunteers were asked to fill up their demographic data and perceptions on obesity complications and varieties of modalities of management including bariatric surgery. Results: A total of five hundred eighty-seven (587) surveys were collected. 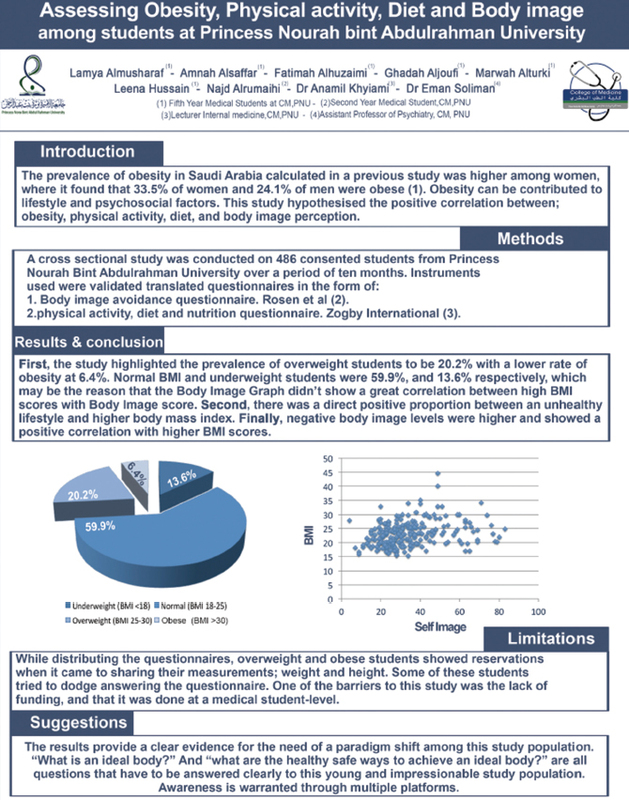 The prevalence of obesity was (21.8%) Which aligns with previous studies in the Gulf region. Respondent Demographics were similar by gender (52.3% for female) and the majority of age group were (39.7%) aged 18-24 years and (39.5%) aged 25-34 years. (65.6%) of respondents are unmarried and (99.1%) had completed high school. (96.9%) were aware that obesity causes significant medical complications. (75%) had attempted to reduce weight. The exercise was the most common selected modality used (67.5%) for weight reduction, whereas, (36.8%) expressed that safety of bariatric surgery is the main concern that might influence their decision. Conclusion: The majority was aware of obesity as a cause of many medical diseases and they prefer to exercise and diet to overcome obesity. 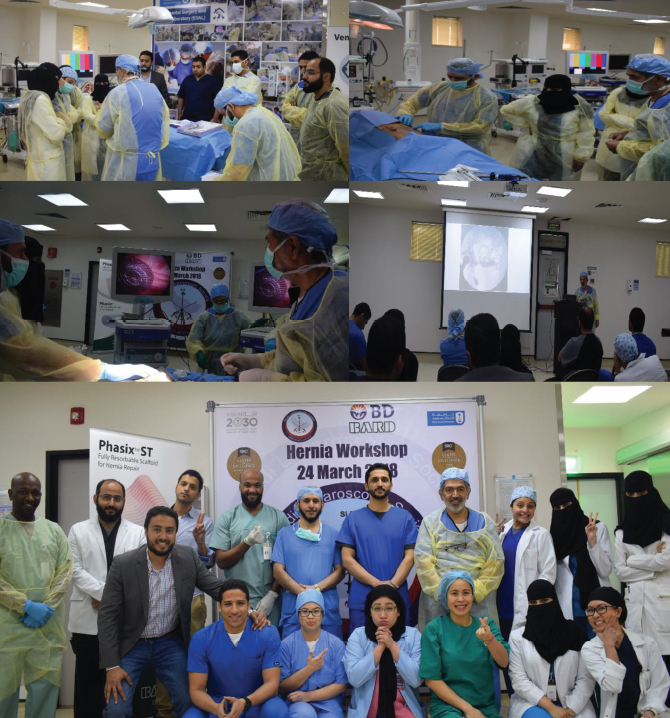 Awareness regarding interventional modalities such as bariatric surgery is needed. Purpose: The incidence of port-site hernia is on the rise as minimally invasive procedures are spreading globally particularly among obese patients. Various devices and techniques have been described to facilitate port-site fascia closure however, most of these device either difficult to use, associated with risk of internal organs injuries from the passer needle or provide unreliable fascia closure. We have invented a new fascia closure device that can address these challenges. Invention Description: A tubular wound closure device houses two retractable proximally oriented hollow needles that can be deployed once the device is inserted inside the fascia defect directly or via an existing port. The needle deployment is controlled via a wheel on the device shaft. Inside each hollow needle is an absorbable anchoring pledget attached to a suture. Proximal to each pledget is a solid pushing rode attached to the device plunger via a stiff wires. Proposed Action: Once the device is inserted beyond the fascia defect the needles are deployed to the desired distance from the device shaft by rotating the needle control wheel. The device is then pulled inserting the needles beyond the adjacent fascia which followed by the deployment of the anchoring pledgets by pressing the plunger. The device is then removed after retracting the needles leaving the anchoring pledgets with their attached stitches to be tied manually closing the defect. Although unknown manufacturing cost can be a barrier. Patent Status: Filed at US Patent Office No: 15/714,986. Filing Date: 09/25/2017. Introduction: Appendectomy is procedure that's performed to treat acute appendicitis by removal of vermiform appendix and still the most common emergency surgical procedure. Appendectomy has two types either Open Appendectomy (OA) or Laparoscopic Appendectomy (LA). Nowadays LA become preferable procedure among some surgeons worldwide but other surgeons still do the traditional OA instead LA. Laparoscopic appendectomy converted to open appendectomy (COA) arise when intraoperative complication occurs or when laparoscopic appendectomy is contraindicated due to severity disease. Methodology: Study Design and Population: It's an observational chart retrospective cross-sectional study. 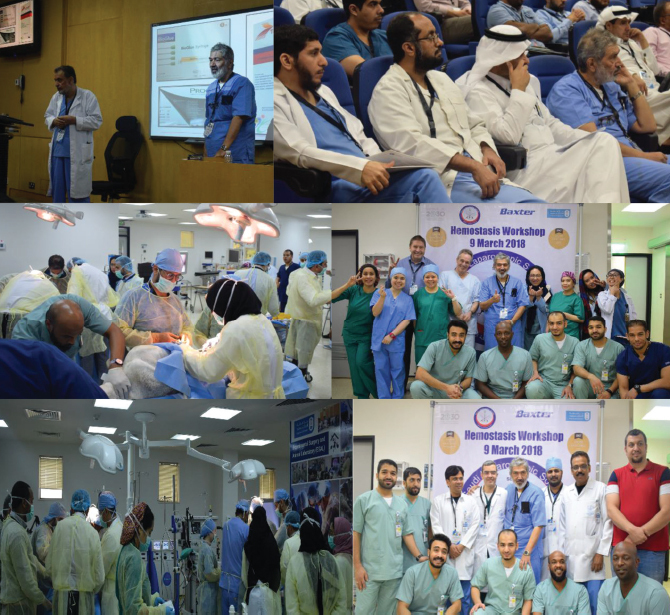 Data was collected from patient medical records who had underwent appendectomy during the last 18 months in KAMC in Riyadh. Ethical Considerations: It was approved by institutional review board (IRB). Results: The study included 405 participants. Of which, 395 (97.5%) underwent LA and the remaining 10 (2.5%) were COA, we found the mean age among patients of COA surgeries, diabetes, total operative and (ER) visits 30 days post-operation of COA surgeries to be significantly higher than those who undergone LA. Conclusions: We found after estimation of the rate of conversion to open appendectomy in our study that being of an old age and/or being a diabetic patient is a predictive factor/s affecting the state of remaining as (LA) or converting to an open appendectomy. In addition, total operative time hospital stay and (ER) visit following 30 post operation was affected by converting to (OA).